Hydrogen bonds will be covered in more detail in this chapter. These weak bonds allow different molecules to recognize one another and join together to carry out biological functions. shared between atoms in order for their outer orbitals to be filled. This forms a double covalent bond indicated by two lines between the atoms—for example O=C=O (CO2). Different elements require different numbers of electrons to fill their outer orbitals, and these numbers determine the number of covalent bonds that each element can make. This information is given in table 2.1 for the elements most important in the living world. All covalent bonds are strong. The stronger the bond, the more difficult it is to break. Consequently, covalent bonds do not break unless they are exposed to strong chemicals or large amounts of energy, generally as heat. Molecules formed by covalent bonds never break apart spontaneously at temperatures compatible with life. Since most biological systems function only within a narrow temperature range (approximately 5°C-100°C) and cannot tolerate the high temperatures required to break these covalent bonds, cells utilize protein catalysts called enzymes, which can break these covalent bonds at the lower temperatures found in living systems. How enzymes function is covered in chapter 6. ■ Enzymes p. 138. Two atoms connected by a covalent bond may exert the same or different attractions for the shared electrons of the bond. In covalent bonds between identical atoms, such as H—H, the electrons are shared equally. Equal sharing also exists between different atoms, such as C—H, if both atoms have a similar attraction for electrons (table 2.2). The bond is termed a nonpolar covalent bond. If, however, one atom has a much greater attraction for electrons than the other, the electrons are shared unequally, and polar covalent bonds are formed. One part of the molecule has a slightly positive charge and another part a slightly negative charge. An example of a polar molecule is water, in which the oxygen atom has a greater attraction for the shared electrons than do the hydrogen atoms (figure 2.3). Consequently, the oxygen atom has a slight negative charge and the hydrogen atoms a slight positive charge. Polar covalent bonds play a key role in biological systems because they allow weak bonds, termed hydrogen bonds, to be formed. Figure 2.3 Formation of Polar Covalent Bonds in a Water Molecule In a water molecule the oxygen atom has a greater attraction for the shared electrons than do the hydrogen atoms. Hence, the electron is closer to the oxygen and confers a slight negative charge on a portion of this atom. 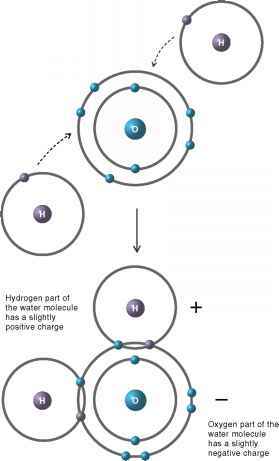 Each of the hydrogen atoms has a slight positive charge on a portion of the atom. Because of these charges, water is a polar molecule. Figure 2.4 Ionic Bond Atom A gives up an electron to atom B; hence, atom A acquires a positive charge and atom B a negative charge. 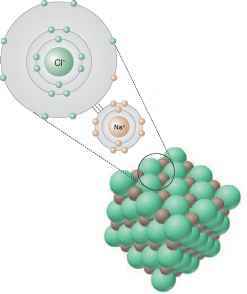 Both atoms then have their outer orbitals filled with the maximum number of electrons leading to maximum stability. The attraction of the positively charged ion to the negatively charged ion forms the bond. ly charged are termed cations; negatively charged ions are anions. The difference between the number of protons and electrons in the ion is indicated by a superscript number. If only a + or - is indicated, then the charge is 1. For example, Na+ indicates a Na ion with one positive charge. Note that the charge is much greater when electrons are transferred from one atom to another than when polar covalent bonds are formed. 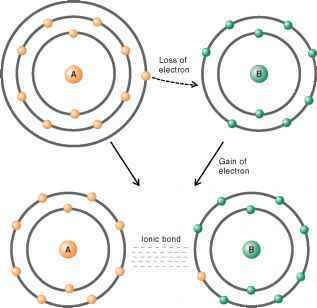 Ionic bonds are an example of extreme polarity. Ionic bonds are important in biology because they are common among the weak forces holding ions, atoms, and molecules together. In water (aqueous solutions), ionic bonds are about 100 times weaker than covalent bonds, because water molecules tend to move between the ions and thereby greatly reduce their attraction for one another. Thus, in aqueous solution, which is common in all biological systems, the weak ionic bonds are readily broken at room temperature. Ionic bonds play another important role in biology. In all biological systems, molecules must recognize one another. 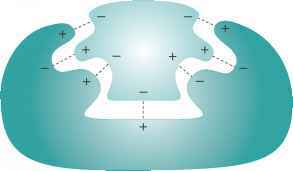 This recognition depends on large numbers of atoms on the surfaces of molecules matching each other precisely (figure 2.5). Large numbers of weak bonds, which include ionic bonds, are necessary to hold the molecules together. In the absence of water, a condition that rarely occurs in biological systems, ionic bonds are strong and account for crystal formation. Such bonds account for the strength of minerals like marble and agate as well as crystals of salt (sodium chloride) (figure 2.6). Figure 2.5 Weak Ionic Bonds and Molecular Recognition Weak bonds, such as ionic and hydrogen bonds, are important for molecules to recognize each other. Many weak bonds are required to hold the two molecules together. Na+ and Cl:Ions This crystal structure is maintained only as long as water is not present to pull apart and keep apart the Na+ and Cl: ions. Figure 2.7 Hydrogen Bond Formation The N atom has a greater attraction for electrons than the H atom, thereby conferring a slight positive charge on the H atom.The O atom has a greater attraction for electrons than the H atom to which it is covalently bonded, thereby gaining a slight negative charge.The positively charged H atom weakly bonds to the negatively charged O atom, thereby forming a hydrogen bond. possibility for many hydrogen bonds. Like ionic bonds, these weak bonds are important in recognizing matching surfaces and holding molecules on these surfaces together (see figure 2.5). In contrast to covalent bonds, hydrogen bonds are constantly being formed and broken at room temperature because the energy produced by the movement of water is enough to break these bonds. The average lifetime of a single hydrogen bond is only a fraction of a second at room temperature, so enzymes, which speed up reactions, are not necessary to form or break hydrogen bonds. Although a single hydrogen bond is too weak to bind molecules together, a large number can hold molecules together firmly. A good example is the double-stranded DNA molecule. The two strands of this molecule are held together by many hydrogen bonds up and down the length of the molecule. 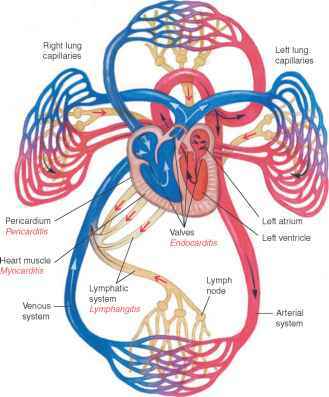 The two strands will come apart if energy is supplied, usually in the form of heat approaching temperatures of 100°C.